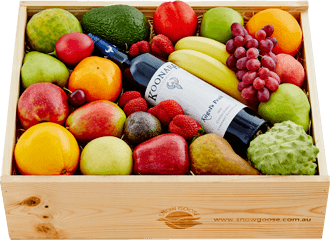 If you're looking for a delectably unique gift idea, Snowgoose's online Darwin Gift Hamper collection delivers your friends and family in Darwin something extraordinary. That's because a Snowgoose gift is so much more than a gift basket. It’s a captivating multi-sensory experience, teeming with unrivalled quality produce from Australia’s top growers and small batch producers. We hand make and exquisitely present each fresh fruit gift basket to order before delivering it to your Darwin recipient. A pleasure to give, and a pure joy to receive, your thoughtfulness will stand out and leave a lasting impression. This match made in heaven is a veritable feast for lovers of exceptional fruit and white wine. 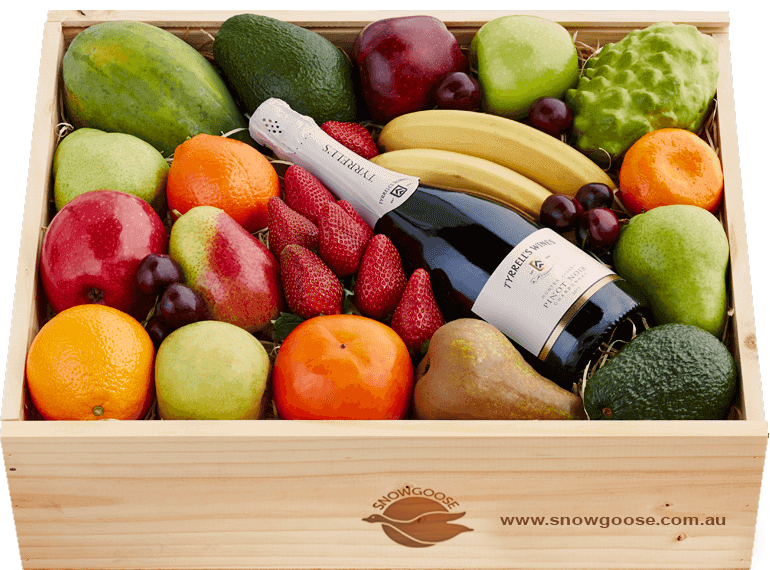 Greeted by a colourful display and orchard aromas, they'll delight in a bounty of famous Snowgoose fruit. Plucked from the trees at the point of perfection, we nestle the flawless pieces into the straw of our signature wooden box and carefully rush them to the doorstep within 48 hours for the freshest just-picked experience. In South Australia's Coonawarra, we discovered the Reschke family's Koonara Vineyard. Only a limited quantity of selected Koonara Angel's Footsteps Sauvignon Blanc is released to the public, making this wine a rare treat. Offering the palate a touch of guava to go with the crisp apple and gooseberry notes, it's the best cool climate wine to complement our selection of fruit. Guaranteed to surprise and delight, this hamper delivers your thoughtfulness in abundance. Celebrate a new arrival with this sparkling baby gift hamper that's a sheer delight to receive. A bounty of our finest vitality-boosting fruit delivers orchard aromas and outstanding fresh flavours to help restore and reward new parents during the early days. To complement our flawless fruit, a bottle of sparkling Pinot Noir Chardonnay Brut from the Tyrrell family's historic Hunter Valley vineyard adds to the celebration. And for further indulgence, Nina's master chocolatiers have put together a personal selection of decadent chocolates, handcrafted in Australia using a base of imported Belgian couverture. With Nature Bubz food grade, durable, non-toxic, flexible and chewable teether and the softest plush white bunny for baby to cuddle, this exquisitely presented Newborn Baby hamper is a gorgeous way to send your heartfelt congratulations. When someone deserves spoiling with a luxurious, unique gift, this delectable hamper is The One. 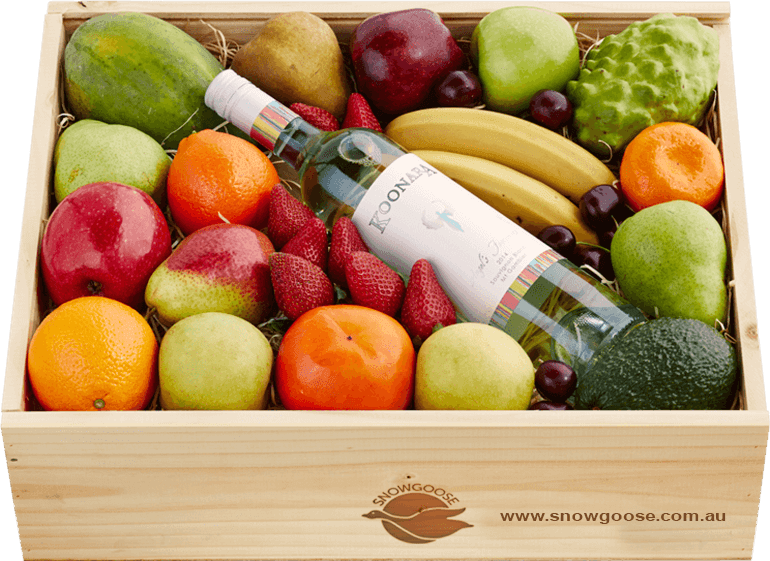 The experience begins with a bounty of our famous Snowgoose fruit, handpicked at the point of perfection and rushed straight to the doorstep within 48 hours. Every flawless piece tempts with orchard aromas and the most mouthwatering just-picked flavours. To add to the celebration, we've selected a bottle of iconic Veuve Clicquot Brut Yellow Label, crafted using grapes from 50 to 60 different crus. Displaying hints of blackberry, white cherry, biscuit and honey, it’s the ideal accompaniment to our signature fruit. Perfect for every occasion, this is one of our bestselling hampers, delivering your thoughtfulness in the most memorable way. When you want to spoil someone with a luxurious gift, this champagne hamper is The One. 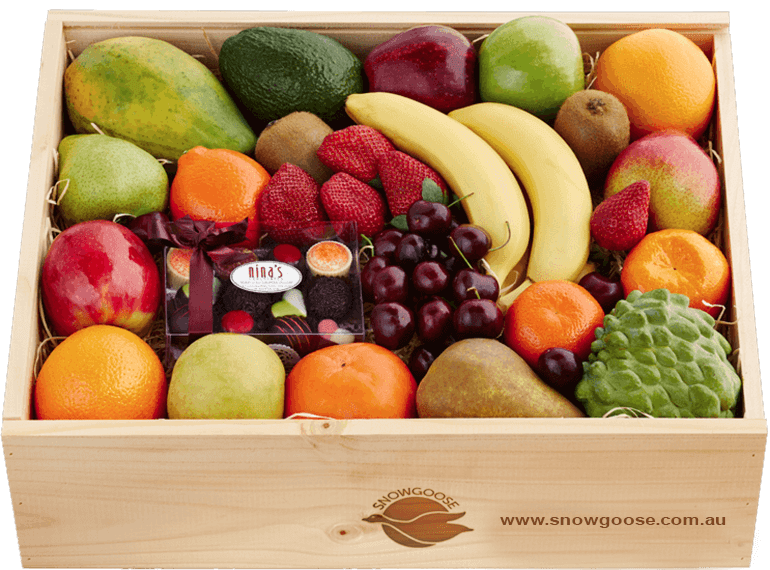 The experience begins with a bounty of our famous Snowgoose fruit, handpicked at the point of perfection and rushed straight to the doorstep within 48 hours. Every flawless piece tempts with orchard aromas and the most mouthwatering just-picked taste. To add to the festival of flavours, we've selected one of the world's most loved champagnes - Moët & Chandon Brut Impérial - the perfect balance of Pinot Noir, Chardonnay and Pinot Meunier. The palate reveals subtle pear, citrus and brioche notes, making it a delightful accompaniment to sip while savouring our flawless fruit. This beautiful hamper brims with thoughtfulness and is a generous choice for celebrating every occasion. It’s often hard to express in words how sorry you are to hear about someone's passing or to commemorate their anniversary. This exquisitely presented condolence gift hamper delivers your thoughtfulness beautifully during this often overwhelming time. Our premium fresh fruit will nourish them with mouthwateringly fresh orchard flavours. Handpicked at the point of perfection, we carefully rush our fruit to the doorstep within 48 hours of plucking from the trees. Nina's master chocolatiers have put together a personal selection of their award-winning chocolates, handcrafted in Australia with Belgian couverture. Together with a lovely candle and a packet of Forget-Me-Not seeds, this gift is always very much appreciated. or call 1800 803 570 for personal shopping help. 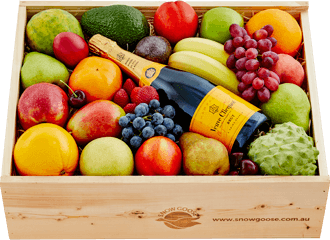 At Snowgoose, we make it easy for you to browse and buy deliciously unique gift ideas online with our beautiful hamper collection. 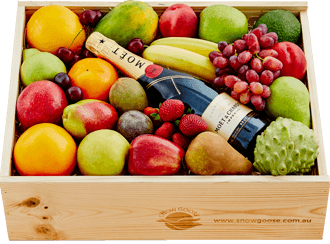 Perfect for every occasion, our range of fresh fruit baskets and gift hampers help congratulate, thank, celebrate birthdays and anniversaries and wish someone better with a healthy get well gift. We have a special collection to send thoughtful condolences, baby hampers for new arrivals, and a new corporate hamper collection for deliveries Darwin wide. 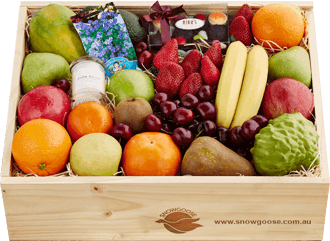 Our Snowgoose gift basket delivery service extends from Darwin metropolitan areas. We deliver our premium fruit gift baskets and hampers to Darwin addresses on Mondays and Wednesdays. Delivery prices start rom $16.00. We believe that in this fast-paced world, people need to feel cherished with a gorgeous gift that helps them take time out to indulge in life's simple luxuries. Darwin's top gourmet baskets and hampers deliver mouth-watering experiences that let your recipients know they're truly thought of and appreciated. At Snowgoose, one of our greatest pleasures is to uncover Australia's best kept gourmet secrets - and then deliver them home for your Darwin recipients to savour in their stunning hamper gift! We journey to every corner of our sunburnt country to find artisans, providores and small-batch producers who live and breathe the art of taste. Like us, they're obsessed with using only top quality ingredients and artisan methods to produce mouth-watering aromas, textures and flavours. From savoury marmalades and chutneys, handmade from foraged ingredients, to authentic cheese slow-smoked over natural oak chips, our online hamper range treats all the senses. One of the world's top pastry chefs introduces his decadent handcrafted nougat, and our sommelier has selected rare and exceptional wines from Coonawarra's Koonara vineyard. No matter which gift basket you choose, every unique gift idea promises to deliver your Darwin corporate clients and friends a taste experience like no other. 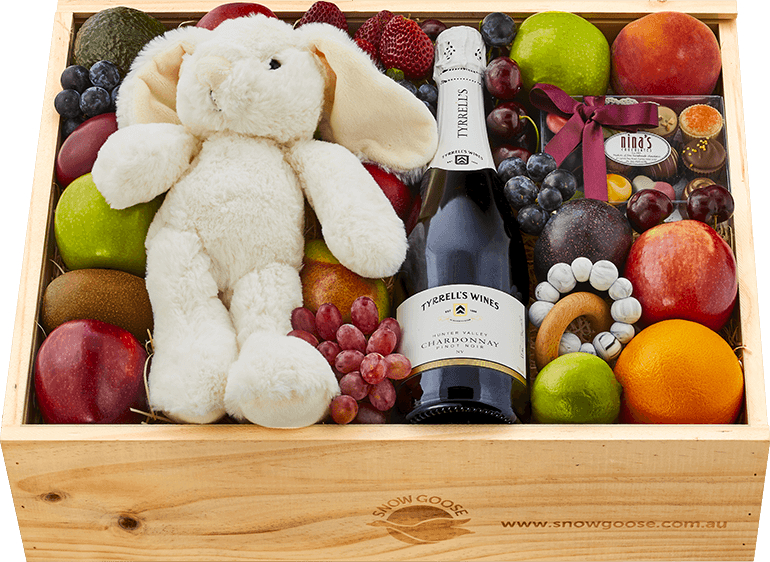 Inspired by nature, crafted by orchards and styled by artisans, Snowgoose gift baskets and hampers brim with Australia's most premium fresh fruit. We have the luxury of selecting Australia's top of the crops, handpicked from the trees at the precise point of perfection. 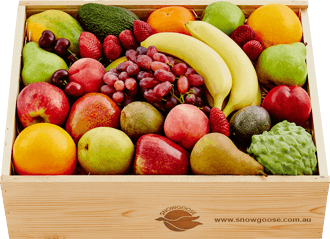 Vibrantly colourful, generously large and supremely sweet, Snowgoose fruit is famous for delivering mouth-watering flavours rushed straight from our orchards and growers and into your Darwin fruit baskets. It's a delight to know that your deserving recipient will indulge in Australia's finest fruit that was on the tree just 48 hours beforehand!